TPV’s Spring 2010 issue is ensconced on the New Publications shelf at Poet’s House in Tribeca, NYC, a worthy Mecca for any fan of poem thingys. Save your loonies for Sunday! Snacks has been working full-time this fall, and there’s no end in sight, at least until after the indie-lit madness that is Canzine, happening in Toronto on Sunday. Look for the big red poetry machine amidst the sea of DIY girls and hipster boys at The Great Hall at 1087 Queen St. West from 1 p.m. till 7, or till we sell out of our Awesome Fall 2010 Issue*, whichever comes first. *BIG thanks to all our poets and everyone who came out to our fall launch at Zoots Cafe last weekend! By all accounts, a great success. 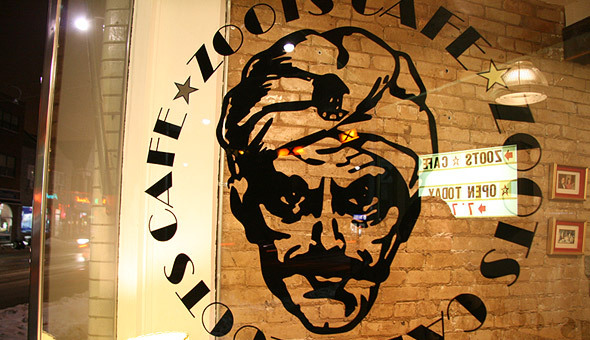 TPV has been very busy this fall, and the fun continues with a new location for our Spearmint machine at Zoots Cafe. This beautiful Dundas and Dufferin coffeehouse is run by Windsor-import-poet Melanie Janisse, who has generously made space on the wall for our slim little crank-operated contraption. Join us October 17 for a launch, featuring readings by poets from our brand new fall 2010 issue and hosted by TPV co-publisher Elisabeth De Mariaffi. Check the details and RSVP here. In other news, TPV will be featured on CBC Radio 1 program The Next Chapter this week, so keep your ears peeled. If you miss it, never fear, we’ll post the link here soon. Thanks to Linda Besner for the love! Plus, TPV will have a table at the one and only Canzine in Toronto on Oct. 24. Stay tuned for more on that soon.